Do you often feel like you have a hard time playing something meaningful when your friends ask you to play 'something' for them? When you’re playing guitar on your own it’s often very hard to create dynamic sounds in a way that completely fills up the room. This mostly comes down to a lack of knowledge on how to create these ‘complete’ sounds on guitar. A lot of guitarists struggle with this and, as a result, their guitar playing sounds very thin. Imagine a 'skinny sound' that’s not appealing at all when listening to. The good news is that anyone can learn to make their guitar playing sound more thick and mature, when combining two of the most important blues guitar techniques. After reading this article and watching the video below, you will blow away your friends the next time they ask you: "can you play something on guitar?". In one of my previous articles (also with video) I talked about pedal notes on guitar. To recap really quick, a pedal tone is a note where we bounce back and forth to when playing. In this previous article about pedal notes I talked about the pedal point technique and how it can be executed on one string. In this article we take it a step further and play with an inverted pedal tone in order to get a more versatile and dynamic sound. An inverted pedal tone simply means that we are playing the pedal tone as the highest pitch. Hybrid picking on the other hand is a guitar picking technique where we play with a guitar pick and one or more other fingers of the picking hand. The right hand of the guitar is an often-overlooked aspect of guitar playing. This hand is the driving force of our guitar playing and there are many possible ways to pick the strings on the guitar, such as alternate picking, economy picking, directional picking, hybrid picking, etc. Hybrid picking is just perfect to use in combination with the inverted pedal point technique on guitar. When executed perfectly, this will result in a sound where a listener might think that there are two guitars playing in the room. With the picking hand, we’re going to use a hybrid picking technique to create these inverted pedal tone licks. We use this hand in a way the ring finger will ring the high e string all the time. This string functions in this example as the pedal note. With the fretting hand, or left hand, we’re going to use the E blues scale in box position (the E minor pentatonic scale in box position is also an option). With the guitar pick from our hybrid picking hand we’re going to play the blues scale. The first step in dominating this crucial guitar technique is to make the scale with pedal notes a part of your muscle memory. Once you get a hang of it, it’s time to discover some licks and to start improvising. The key to a successful execution is to refer back to the pedal note all the time while at the same moment you’re choosing random notes from the E blues scale while you’re playing. This hybrid picking exercise is just a little tip of the iceberg of what you can do with this method of using the high e string as an inverted pedal tone in combination with the E blues scale in box position. Maybe you noticed that in the lick example, there’s one little addition to the E blues scale we’re using. The first fret on the G string isn’t part of the E blues scale, but it’s a note from the E major pentatonic scale. The G# is a major third interval of E and makes the lick very tasty and bluesy as we blend it together with the minor pentatonic scale. Knowing your intervals on guitar is a very powerful and crucial aspect in your development as a guitarist. Not knowing them will result in a ‘walk in the dark’ when improvising on guitar. To get a full understanding of intervals on guitar I strongly advice you to take a look at my Ultimate Guide To Learn Intervals On Guitar. This article contains everything you need to know about guitar intervals with easy understandable images and video. 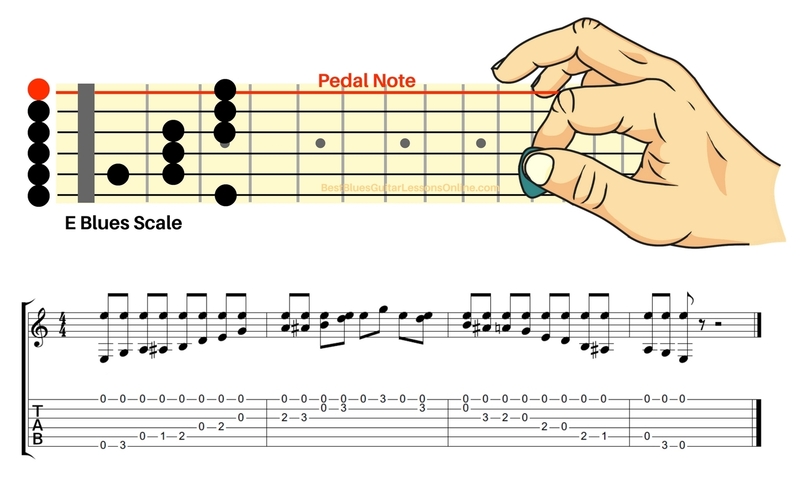 As I said earlier, the picking hand is an often neglected item on the learning list for guitarists. This is a huge shame because it’s the driving force of everything you play on guitar. Not knowing how to use all the guitar picking methods will result in a 'guitar handicap' and big limitations. It’s time to get rid of your right hand limitation once and for all with my free Best Picking Exercises For Guitar Guide. Feelings of not progressing at all with your blues guitar skills? Stuck with the same old licks and don’t know how to break out of it? Free yourself with my Essential Blues Lesson For Soloing.